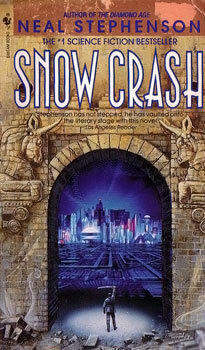 The geek enclaves of the net are buzzing with the news that Neal Stephenson’s 1992 classic Snow Crash may be appearing on the big screen soon. Paramount have signed Joe Cornish to write and direct after the critical acclaim he received for his directorial début Attack the Block. It’s not clear yet whether the movie will be live action or purely digital – Joe Cornish has had experience with both (he was one of the writers for the Tin-Tin movie) or possibly, given his earlier work, a stop-motion version, with cast members being made up of old Star Wars toys. Given the complex nature of both the plot and the large volumes of information that flow between the storyteller and the reader/audience, this story would be a challenge for any director. There will be a significant amount of technology to reproduce, both in the form of digital worlds (including Earth, which is supposedly the inspiration for Google Earth), vehicles and robotic guard dog units. Snow Crash is a long time favourite of mine, and I for one wish him luck – it would be great to see a successful cinema adaptation. And if they pull it off, can I put in a request? Do Diamond Age next. That, is a cracker.